The trip was really good: busy, warm, and wonderful. We stuffed the SD trip full of great food, beaches, the Zoo, mounting paintings, and seeing my family again. Since we'd gotten our ticket so late, we came home again on Friday and had the whole weekend to make our own turkey (yum, leftovers! ), pumpkin pie, and stuffing with gravy, and then John's birthday was Sunday. We celebrated that with a three mile walk around a lake, and going to dinner where he wanted and my "chocolate thingy"s for dessert. The flights to and from were easy, though the airports were more crowded on the way there on Sunday. We even met up with a family from church that was also going to SD, and found out that the Mom had worked with my sister nearly twenty years ago. Her brother had also gone to Caltech the same time John and I had. Small, small world. We had hot pot for dinner that night, where they set up an on-table gas burner and boiled broth so that we could toss beef, fish, shrimp, scallops, spinach, fish and shrimp balls, glass noodles, tofu blocks, Chinese cabbage, and other things into the pot. They were fished out when they were as done as folks wanted them, and we dipped the food into this silky peanut sauce before eating with rice (if we wanted rice). It was wonderful, and Jet got to eat as much tofu as he wanted, which tickled my Mother a great deal. 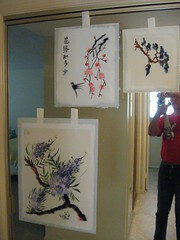 Monday morning my Mom and Dad taught John, Jet, and I to mount my paintings on a backing paper. The Shuen papers I've been using kind of deform a little when wet and then dried. The single layer shuen is much, much thinner and really fragile and wrinkles a lot after it's been painted, but the single thickness also makes for some incredible color visibility. So the whole process is about gluing another sheet of paper on the back and then gluing the wet painting and paper to a completely straight surface so that the whole sandwich dries straight. It's pretty convoluted, using a simple flour paste with a little alum to discourage the bugs, and lots of water, a good surface, and we ended up with six paintings up on the mirrors of Mom and Dad's closets. It was really cool. We might be able to use the mirrors in our bathrooms at home or the glass on our shower stalls along with a plate of plexiglass we bought for that use. I want to write up and do pictures for the whole process and make a tutorial for it as nearly all the explanations I've seen in books and online have been inadequate for actually getting the paper to be completely straight. We spent the afternoon on the beach. Hee. Building sand castles of all kinds, watching the sand pipers and her babies, and boogie boarding. That is John and Jet in the background. The water was cool to the touch, but once the guys started really running around and swimming and playing they were warm enough. We'd found a beach that was south of Mission Bay, right up against the San Diego river, with a water break right north of the river. The sand there was really fine and soft, built beautifully and carved easily. We could make enormous, solid sand balls that were so heavy they thunked into the sand when thrown and wouldn't break. I was really impressed by the sand. What was even better was that there was a public bathroom with showers Right There, just off the enormous parking lot, and there were nearly no people. 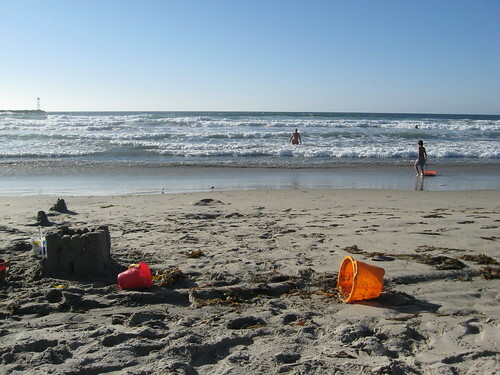 Unlike Torrey Pines or La Jolla Shores or La Jolla itself or Pacific Beach, the place had great parking, good facilities, easy access, and wonderful sand and surf. There were surfers out in it, in wet suits as the water was still pretty cold, but there were five sets of breakers coming in, so plenty of action no matter how deep one wanted to get into it. It was really great, and we went back there on Wednesday. Tuesday was the Zoo. 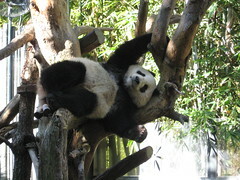 I think that this is Mei Sheng, he was kind of showing off when we got to the panda exhibit. *laughs* He's a cutie, as was his little sister, who was in the next enclosure over. She was just pacing, though, but he was hanging out watching people wander through. The Zoo is 100 acres in size, and contains over 4000 animals, so there's a lot there to cover. We started off with Mom and Dad and after we'd gone where they wanted, they went back home to rest. Then we walked for a long time, took the bus tour that covered a good deal of the part without having to walk much, and then Kathy came to see what she wanted to see and we followed her around and ended up on the skyride seeing everything below us as we wandered through. One of the cool things was being able to attend a lot of the keeper talks as they were going on every hour on the hour at various enclosures. 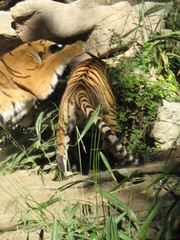 I managed to catch one of the tigers pouncing on another one as we were listening to the talk. They seem to like showing off for the visitors. *laughs* That was really fun. 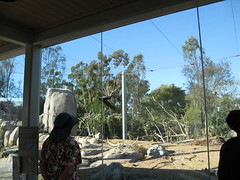 One of the coolest things was seeing an enclosure with three California Condors in it and see the data on how the condor is making a gradual comeback with lots of human intervention, effort, and care in raising them. The amazing thing was watching one of the actually fly across the enclosure. Go ahead and click that picture, and see one of the bigger sizes of it (click "all sizes"). I'll wait here. That night we went to one of Mom and Dad's favorite Chinese restaurants and had a small banquet, with a whole tea smoked duck, crispy tofu for Jet, spinach with garlic, slow cooked pork ribs, and lots of other goodies. It ended with hot bowls of my favorite sweet fermented rice soup with black sesame soup balls and fortune cookies, and we were very, very content. One thing that amused and surprised me on Wednesday was that we went to In and Out burger and John and I ordered our usual burgers, but Jet was with us. They only do a single burger, a single cheese burger, a double cheese burger, or a double-double. Jet doesn't eat burgers, so for my child, I mustered the courage to ask for a cheeseburger without the burger! Turns out that they do grilled cheese! Just cheese on a bun. That made Jet very, very happy indeed. Hee. I also made the pumpkin pie on Wednesday, to clear the decks on Thursday for the turkey and everything else. Mom was amazing and let me do most of the cooking, which isn't easy. We negotiated a lot of stuff, and it all worked out. 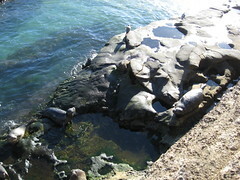 While the turkey was roasting, Kathy, John, Jet, and I went to walk around La Jolla Cove, see the seals, and walk the seawall. The walk was fun. The Thanksgiving feast was a success, the pie was all eaten, football was watched, and I even caught a little bit of the fireworks going off at Sea World. We came home Friday, got good and settled in, happy with being able to play with the stuff we'd left at home, and sleep in our own beds again. I helped the Board of Worship decorate the church for Advent, which involved a lot of ladder climbing and wrestling of Greenery. The boys put our tree up while I was away, and when I got home, I cooked our turkey. Our convection oven finished it off in about two hours! That was fast, and the gravy was good and dark. We just made do with stuffing and frozen peas, not the whole kit and kaboodle again, and it was a very relaxed dinner. Sunday was John's birthday, and we all went to church. Anyway... we had turkey for lunch and then John chose to have us all do the walk around Machintosh Lake for his birthday Thing To Do. So we took Jet's bike and the three of us went the three miles around the lake. The view is magnificent out there, with a 120 degree view of the Front Range, the water, the birds, the few trees around there, and the prairie dog towns that have sprung up around there. We met neighbors, folks from the church, and some of Jet's school mates. It was a lot of fun to do together, and it completed a full week of having over ten thousand steps a day with a whopping 18,000 steps. We went to Noodles and Company for dinner, and then John asked me to make my little flourless chocolate cakes for dessert. We did a little origami ornament making and then hot tubbed before Jet went to sleep. John got a lot of calls for his birthday after dinner, and he was very happy for the day, so that was all good. It was a really great week, all in all, and lots of things to be thankful for. I hope that everyone else who celebrates the US Thanksgiving had a fun time, too!! I can remember when the zoo was just really getting going with the Wild Animal Park in Escondido to try and bring the condor back. That's great that they're having success! Sounds like a very pleasant holiday indeed! *laughs* Yes. Though it's been a while since I've seen Fire... but I do still visit bits of the Horde every year or two. I am pretty amazed we never crossed paths, really either, but I never played in the MUSHes much either. Too overawed... *laughs* Between Cera, Bryant, and others, it was fun to just watch from too. *grins* We might have met there, too? I dunno. Hee. Yes. Incandescens is fun to talk with, very much, and AIM is much easier to use than the mush system. (grins) It was. Very nice. Wowzers that was an exceptionally full few days. But they sounded lovely. I adored John's choice of birthday to do. I think it's a hoot that all the things Jet will eat and try that he doesn't do bugers. XD so cute!! XD Yeah... he won't eat casseroles of any kind, he dislikes mac and cheese usually, and doesn't like hamburgers. I think he's just like any other kid, it's just what he's picky about is different.